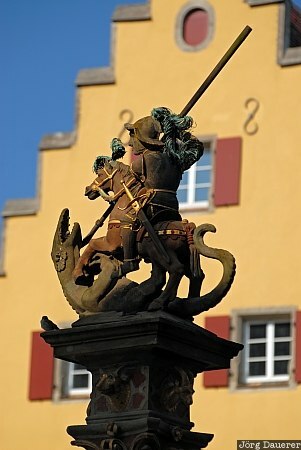 A statue of St. George in Rothenburg ob der Tauber in front of a typical colorful facade. Rothenburg ob der Tauber is in Franconia in northern Bavaria, Germany. This photo was taken in the evening of a sunny day in June of 2009. This photo was taken with a digital camera.